AS MANY FLASH NEWS NETWORK READERS / VIEWERS HAVE POINTED OUT RECENTLY, THE CDC IS LOOKING TO USE "VESICULAR STOMATITIS" AS THE RNA FOOTPRINT FOR CREATING AN EBOLA VACCINE: WE NOW HAVE THE EARLY RELEASE DOCUMENT THAT PROVES THAT THEORY CORRECT! We demonstrated that previous vaccination with a vesicular stomatitis virus (VSV)–based Lassa virus vaccine does not alter protective efficacy of subsequent vaccination with a VSV-based Ebola virus vaccine. These findings demonstrate the utility of VSV-based vaccines against divergent viral pathogens, even when preexisting immunity to the vaccine vector is present. Viral hemorrhagic fevers (VHFs) are caused by a group of genetically distinct zoonotic viruses, which include ≥4 virus families (Filoviridae, Arenaviridae, Bunyaviridae, and Flaviviridae). Because of major and often highly publicized outbreaks, the most recognized VHF agents are Ebola virus (EBOV), Marburg virus (MARV), and Lassa virus (LASV). However, there are many other prominent etiologic agents of VHFs that (when infection numbers are combined) result in hundreds of thousands of infections annually, which cause a major burden to public health care systems worldwide (1). Illness and death associated with these pathogens, combined with the threat of intentional release, has led to intensive research efforts to develop rapid-acting, safe, and effective medical countermeasures to control the spread of VHFs. Because of nonspecific clinical onset; rapid progression to severe disease; uncertain pathophysiology of disease; and high viral loads in blood, secretions, or excretions of affected patients that can result in human-to-human transmission, the ideal countermeasure remains prophylactic vaccination. Several vaccine platforms have shown efficacy against individual VHF pathogens, many of which are based on similar platforms (1). 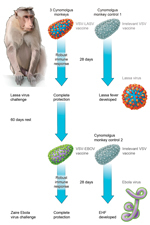 Among the most successful VHF vaccine candidates are recombinant, replication-competent vesicular stomatitis virus (VSV)–based vectors, which in animal models have proven highly effective in preventing lethal disease after challenge with a variety of high-consequence viral pathogens, including, but not limited to, EBOV, MARV, and LASV, as well as Andes (ANDV) and Nipah viruses (2–5). Although protective efficacy of individual vaccination in challenge experiments is evident, few studies have addressed the effect of sequential, long-term, vaccination strategies with 1 vaccine platform against multiple VHFs, including the VSV-based strategy. One study showed that a single vaccination, using a vaccine made from multiple VSV filovirus vaccines, affords protection against an otherwise lethal challenge with distinct EBOV species and a MARV isolate (6). In addition, multiple consecutive vaccinations in a short period (≤14 days) with filovirus-specific VSV vaccines have been shown to elicit protective, possibly cross-reactive, immune responses in nonhuman primates (NHPs) (6,7). However, it remains unclear whether sequential vaccinations within a population that has mounted a complete humoral immune response (≥90 days) after an initial vaccination with a VSV-based vaccine would elicit a robust and protective immune response after vaccination with a second VSV-based vaccine. Although this question was previously overlooked because of the restricted geographic distribution of many etiologic agents of VHF for which VSV-based vaccines have been tested, the emergence of EBOV in countries in West Africa to which LASV is endemic has heightened concerns of use and efficacy of 1 vaccine platform against multiple agents of VHF (8). The purpose of this study was to determine if previous vaccination with a VSV-based LASV vaccine would reduce the efficacy of subsequent vaccination with the VSV-based EBOV vaccine (Figure). This study was conducted in accordance with a protocol approved by an Institutional Animal Care and Use Committee of the National Institutes of Health. All laboratory work with potentially infectious materials was conducted in a Biosafety Level facility at the Rocky Mountain Laboratories (Division of Intramural Research/National Institute of Allergy and Infectious Diseases/National Institutes of Health). Three cynomologus macaques were vaccinated with 1 dose of 107 PFU of VSVΔG/LASVGPC, a live-attenuated, recombinant viral vaccine in which the VSV surface glycoprotein has been replaced with those of LASV, by intramuscular injection as described (4). Another age-matched control animal was vaccinated with an irrelevant VSV-based vaccine (VSVΔG/ANDVGPC) (5). At 28 days postvaccination, the 4 NHPs were challenged with a lethal dose of LASV (104 50% tissue culture infectious doses [TCID50s]) (9). The control animal showed signs of Lassa fever 7–10 days postinoculation and was euthanized 13 days postchallenge because of severity of disease. Classic indicators of Lassa fever, including decreased total protein and albumin; increased serum levels of alanine aminotransferase, aspartate aminotransferase, amylase, blood urea nitrogen, and alkaline phosphatase; and hematologic abnormalities, including thrombocytopenia and lymphopenia, were apparent in this animal. Virus isolation conducted for select tissue samples showed LASV antibody titers of 5–7 log10 TCID50/g of tissue; blood samples collected on day 10 and at the time of euthanasia (5 and 6.25 log10 TCID50/mL, respectively) showed viremia. In contrast, the 3 animals vaccinated with VSVΔG/LASVGPC resisted lethal LASV challenge and did not demonstrate any clinical signs of disease or any hematologic or biochemical indicators of LASV infection. At no point in the study was virus found in blood samples collected regularly from these 3 animals, even when tested by sensitive reverse transcription PCRs. An ELISA with serum samples collected 45 days postchallenge demonstrated equivocal antibody titers (100) against a recombinant LASV nucleocapsid protein in 1 NHP. The other 2 animals did not show seroconversion, which suggested that vaccination caused nearly sterile immunity against LASV (Table). Approximately 90 days after the original vaccination with VSVΔG/LASVGPC, the 3 NHPs were vaccinated with a single dose of 107 PFU of VSVΔG/EBOVGP by intramuscular injection as described (3). An additional NHP was vaccinated with a control vaccine as outlined above and served as the inoculation control. At the time of vaccination, the 3 macaques had a robust VSV-specific antibody response with titers of 25,600, as determined by a whole virus ELISA (Table). Despite this finding, the 3 animals that received the VSV-based EBOV vaccine mounted an efficient response to the EBOV glycoprotein (Table) and were completely protected when challenged 28 days later with a lethal dose of EBOV (103 PFU) (10). Postchallenge, the 3 NHPs did not show any clinical signs of disease. Hematologic and serum biochemistry values remained constant throughout the study, and virus was not found in blood samples collected regularly and tested by using real-time reverse transcription PCR. In contrast, severe EBOV hemorrhagic fever developed in the control animal, which was characterized by increased serum concentrations of alkaline phosphatase, aspartate aminotransferase and alanine aminotransferase; thrombocytopenia; and viremia (≥7 log10 TCID50/mL whole blood) beginning 3–6 days postchallenge. This animal was euthanized 7 days postchallenge, and titration of selected tissue samples showed EBOV antibody titers of >9 log10TCID50/g tissue. An ELISA conducted at the conclusion of the study (42 days post–EBOV challenge) showed increased antibody responses to VSV (titers ≥125,000) and seroconversion to the EBOV viral protein 40 antigen (titers ≥6,400) in the 3 surviving NHPs (Table), which is consistent with published results (10). Because of the remote locations where VHF agents are present, an overall shortage of health care professionals and clinics in these locations, and mobility of human populations, any vaccine against these pathogens would ideally need to elicit a protective immune response after a single vaccination. For this reason, replication-competent viral vectors are considered leading VHF vaccine candidates. As the VSVΔG/EBOVGP vaccine heads toward clinical trials, it is necessary to clarify the potential limitations of using the VSV platform against multiple VHF agents. A major drawback for many viral vector platforms is preexisting immunity against the vector itself, which can decrease or nullify the essential protective immune response, which results in vaccine failure. Design of the VSV-based vaccines, which encode and express glycoproteins from various pathogens without its own glycoprotein (11,12), suggest that preexisting immunity would not influence protective efficacy of individual vaccinations (12). However, until now, this possibility has not been examined in disease models. Results of this study demonstrate that multiple VSV vaccines can be used in a population without any deleterious effect on overall protective efficacy. Dr Marzi is a staff scientist in the Disease Modeling and Transmission Section, Laboratory of Virology, Rocky Mountain Laboratories, Hamilton, Montana. Her research interests include vaccine development and the pathogenesis and cellular entry of filoviruses. We thank the Rocky Mountain Veterinary Branch for assisting with this study and Ryan Kissinger for preparing the figure. This study was supported by the Division of Intramural Research National Institute of Allergy and Infectious Diseases, National Institutes of Health.